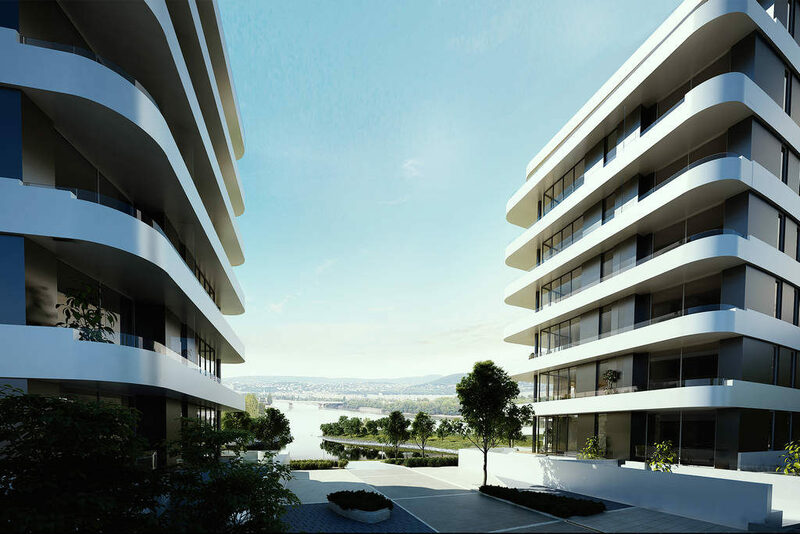 Autóker Holding Zrt, a developer known for iconic residential real estate developments in Budapest, presents Marina Bay Residence 2, the latest bay-side project on the shore of the Danube. With 39 exclusive apartments tailored to the needs of premium customers, the building is the authentic choice of people committed to luxury without compromises. The neo-modernist building, designed by an international team of Promega and S.I.A.H. Architects, will focus on maximum convenience, with smart home functions for individually controlled floor heating and air conditioning, as well as accessible, high-quality “lift-push” doors and windows with large glass surfaces and aluminium frames for a comfortable connection between the interior and exterior of the building. The carefully designed, ergonomic homes will feature premium materials as well as a remarkable ceiling height of over three metres. For environmental consciousness, renewable energy will be used to cool and heat the apartments; the two guarded and temperature-controlled parking levels will come with bicycle storage spaces as well as optional state-of-the-art electric car loading facilities. A central camera system and 24-hour gate guarding will ensure 24/7 security. The exciting staggered forms of the neo-modern building, with a white ledge overhanging the façade, harbours ergonomic apartments and generous terraces with a perennial vista. The building, which radiates refinement in every detail, is constructed using state-of-the-art and time-resistant premium materials. The entire façade is dominated by huge glass surfaces that ensure well-lit interior spaces. And the gracious glass railings allow an unobstructed vista of the picturesque Danube and the Buda hills. The imposing, southwest-facing, sunny apartments, with a ceiling height over three meters, are designed flexibly, in varied sizes, in line with our customers’ needs. The exclusively designed apartments feature several bedrooms and en-suite bathrooms, and even the internal rooms offer extraordinary views. Thanks to careful design, the smaller (compact and mid-sized) apartments will also be comfortable, fully functional luxury homes. Uniquely ergonomic luxury penthouse apartments with a breath-taking view, an unparalleled panorama, wide terraces, and pools will be located on the top floors of the building. The harmony radiated by the exclusive environment will be matched by premium internal materials of the highest standards, as well as by uniquely designed and automated kitchen and bathroom furniture. The phototube-controlled main door of the building leads into a grand internal reception lounge reminiscent of a five-star hotel, with elegant armchairs, an exclusive reception desk, and remarkable interior design. Round-the-clock guarding and surveillance cameras guarantee security and comfort to both residents and their guests. Comprehensive interior design counselling is available upon request. Modern, fixed, accessible, “lift-push” aluminium terrace doors and hopper-casement windows, with triple-layer heat-insulating glass. Beautiful apartment entrance doors with strong sound, heat and fire proofing and multi-point locks, certified by the Association of Hungarian Insurance Companies. Guarded, easily accessible two-level underground parking facility with generous parking spaces and separate storage rooms for each apartment. Locked bicycle storage room on parking level -1. E-car loading bay available upon request, in line with the spirit of our time. Bi-directional communication (with video and sound) with the facility guards and guests at the gate.